Deerhounds live from 7 to 10 years of age. 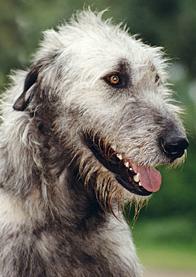 The Deerhound is loyal and dignified and adores children and is an ideal family pet. Though a big dog it patient and docile, but can be called upon to act against intruders if needed. A Deerhound should live happily with other household pets. However, since they were bred to chase and catch game, the sight of a small animal running may trigger a response. Your Deerhound may share companionship with your indoor cat, but may change its attitude outdoors when a cat runs past. Most owners report their Deerhound and other pets get along fine, but it is best to use caution to prevent any "chasing mishaps". The adult Deerhound enjoys as much exercise as you can give it. A puppy will exercise sufficiently by just playing with the family, or other dogs each day. Some Deerhounds can be extremely sensitive and need almost no disciplining, where others try your patience to the limit. The Deerhound requires only moderate grooming. If a Deerhound is an outdoor dog it needs to be provided with a draught-free kennel not too far from the house as Deerhounds like to be close to the family and will feel rejected if banished outside.